When viewed through a light microscope, cytoplasm usually appears as clear jelly with specks scattered throughout. However, a transmission electron microscope (see fig. 3.4), which produces much greater magnification and ability to distinguish fine detail (resolution), reveals that cytoplasm contains networks of membranes and organelles suspended in a clear liquid called cytosol. Cytoplasm also contains abundant protein rods and tubules that form a supportive framework called the cy-toskeleton (sicto-skel-i-tun). Perhaps nowhere else in the body are cells attached as firmly and closely as they are in the 400-mile network of capillaries in the brain. The walls of these microscopic blood vessels are but a single cell thick. They form sheets that fold into minute tubules. A century ago, bacteriologist Paul Ehrlich showed the existence of the blood-brain barrier by injecting a dye intravenously. The brain failed to take up the dye, indicating that its blood vessels did not allow the molecules to leave and enter the brain's nervous tissue. Studies in 1969 using the electron microscope revealed that in the brain, capillary cell membranes overlap to form a barrier of tight junctions. Unlike the cells forming capillary walls elsewhere in the body, which are pocked with vesicles and windowlike portals called clefts, the cells comprising this blood-brain barrier have few vesicles, and no clefts. Certain star-shaped brain cells called astro-cytes contribute to this barrier as well. The impenetrable barrier that the capillaries in the brain form shields delicate brain tissue from toxins in the bloodstream and from biochemical fluctuations that could be overwhelming if the brain had to con tinually respond to them. It also allows selective drug delivery to the periphery— for example some antihistamines do not cause drowsiness because they cannot breach the blood-brain barrier. But all this protection has a limitation—the brain cannot take up many therapeutic drugs that must penetrate to be effective. By studying the types of molecules embedded in the membranes of the cells forming the barrier, researchers are developing clever ways to sneak drugs into the brain. They can tag drugs to substances that can cross the barrier, design drugs to fit natural receptors in the barrier, or inject substances that temporarily relax the tight junctions forming the barrier. Drugs that can cross the blood-brain barrier could be used to treat Alzheimer's disease, Parkinson's disease, brain tumors, and AIDS-related brain infections. 1. Endoplasmic reticulum. 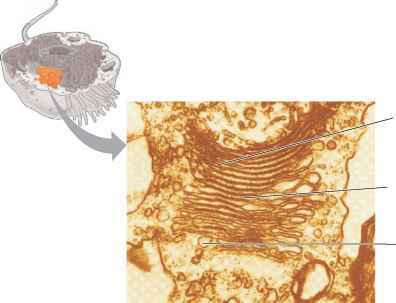 The endoplasmic reticulum (encdo-plazmik re-tikou-lum) (ER) is a complex organelle composed of membrane-bound flattened sacs, elongated canals, and fluid-filled vesicles. 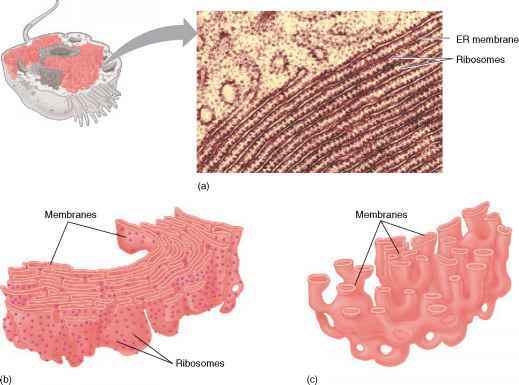 These membranous parts are interconnected, and they communicate with the cell membrane, the nuclear envelope, and certain cytoplasmic organelles. 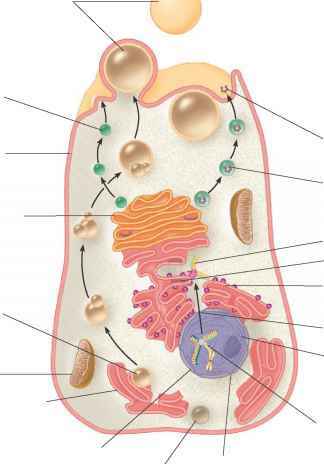 ER is widely distributed through the cytoplasm, providing a tubular transport system for molecules throughout the cell. The endoplasmic reticulum also participates in the synthesis of protein and lipid molecules, some of which may be assembled into new membranes. Commonly, the outer membranous surface of the ER is studded with many tiny, spherical organelles called ribosomes (ricbo-somz) that give the ER a textured appearance when viewed with an electron microscope. Such endoplasmic reticulum is termed rough ER. Endoplasmic reticulum that lacks ribosomes is called smooth ER (fig. 3.10). The ribosomes of rough ER are sites of protein synthesis. The proteins may then move through the canals of the endoplasmic reticulum to the Golgi apparatus for further processing. Smooth ER, on the other hand, contains enzymes important in lipid synthesis. Some cells are joined by intercellular junctions, such as tight junctions that fuse neighboring membranes, desmosomes that serve as "spot welds," or gap junctions that allow small molecules to move between the cytoplasm of adjacent cells. Cellular adhesion molecules (CAMs) direct white blood cells to injury sites, such as this splinter. Selectin proteins latch onto a rolling white blood cell and bind carbohydrates on the inner blood vessel wall at the same time, slowing the cell from moving at 2,500 micrometers per second to a more leisurely 50 micrometers per second. 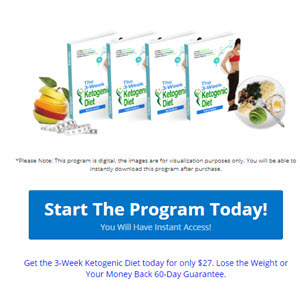 Chemoattractants are secreted. 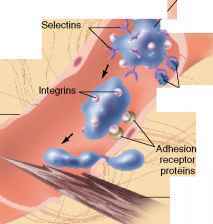 Then integrin proteins anchor the white blood cell to the blood vessel wall. Finally, the white blood cell squeezes between lining cells at the injury site and exits the bloodstream. 2. Ribosomes. Besides being found on the endoplasmic reticulum, some ribosomes are scattered freely throughout the cytoplasm. All ribosomes are composed of protein and RNA and provide a structural support and enzymes required to link amino acids to form proteins (see chapter 4, p. 127). 3. Golgi apparatus. The Golgi apparatus (golje ap9ah-raotus) is composed of a stack of half a dozen or so flattened, membranous sacs called cisternae. This organelle refines, packages, and delivers proteins synthesized by the ribosomes associated with the ER (fig. 3.11). 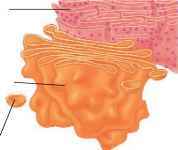 Proteins arrive at the Golgi apparatus enclosed in tiny vesicles composed of membrane from the endoplasmic reticulum. These sacs fuse to the membrane at the beginning or innermost end of the Golgi apparatus, which is specialized to receive proteins. Previously, these protein molecules were combined with sugar molecules as glycoproteins. (a) A transmission electron micrograph of rough endoplasmic reticulum (ER) (28,000x). (b) Rough ER is dotted with ribosomes, whereas (c) smooth ER lacks ribosomes. (a) A transmission electron micrograph of a Golgi apparatus (48,000x). (b) The Golgi apparatus consists of membranous sacs that continually receive vesicles from the endoplasmic reticulum and produce vesicles that enclose secretions.